This New Orleans black and gold 3 head garden lamp post with clear lantern glass brings the American look to your home. 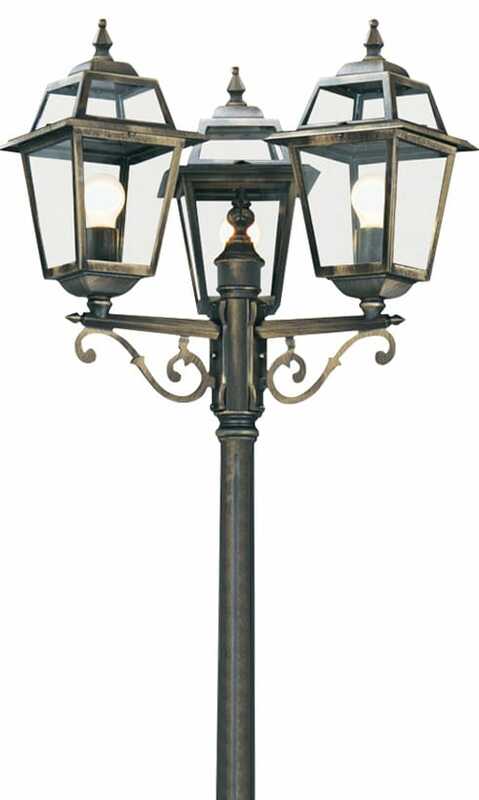 The traditionally designed street lamp has a tall cast aluminium post and three ornate cast aluminium lanterns at the top, with clear glass to light your garden and outdoor areas. It is rated IP44 and fully splashproof to protect against the elements. A traditional American style cast aluminium outdoor lamp post finished in black with gold highlights. With a sturdy hexagonal base and tapered stem, three braced scrolled lamp arms and clear glass lantern panels. Part of the New Orleans range of IP44 rated garden lights. Alchromated for extra durability with a 3-year finish guarantee. what is the distance between the centers of the fitting bolts and is the Hex base 23cm between the flats of the New Orleans Black and Gold 3 Headed Garden Lamppost. Could you supply a template of the anchor points? Hi Ken. The distance betwwen the fixing bolts is 20cm and the base diameter is 23cm. Unfortunately we do not have a template for the anchor points. Kindest regards, John.